Thank you, Ann. Shannon had that tutu made for her when she was still little, and we have other photos of a mini-her wearing it as well. She’s not quite 29 months old, and already looks to grown up for this daddy’s taste. Still, there’s no denying how cute she is. Aww…. she is so stinking cute!! You better start getting ready, she’s gonna be a heart breaker!!! “Stinking cute” is probably a good description. She’s already got one guy wrapped around her little finger. In truth, though, while she may break hearts, I suspect it will break hers to do so. She’s a sweet little soul. Can you tell I adore her? Have a safe and Happy New Year, Nicole. I hope you and a great New Years weekend and have a wonderful New Year! Oh, I just wanted to let you know that every time I come to your guys’ feet up there I just want to tickle them!! Too cute! Been meaning to tell you for a while now. Yes, I’m definitely wrapped around her little finger. How could I not be? 🙂 On the subject of my feet photo (which I use on twitter, facebook, google, etc.) my wife says I need to change it to my face at some point. Personally I see no reason to scare readers away. Perhaps I hold a blog vote for which picture I should use as my avatar. Thank you. I’m forced to agree. 😉 Loved your Santa’s Sweet Reprieve blog. Have a lovely New Year! I love this photo! She is absolutely beautiful! Awww… thank you, Mitzi. It was Texas’s loss when you abandoned us to live and love in another. state We however forgive you, as your happiness is our prime concern. Regarding this photo, yes, I must concur, she is absolutely beautiful. What else is a daddy going to feel? Hope you all are having a great holiday season. Pretty much says it all; thanks, Kristin. On an unrelated subject I left you links to the dietary approach I’m taking to finally get rid of my “baby bump” on your blog. Hope you have a wonderful new year! So adorable! Love the Pigtails!! My girls were bald (or peach fuzz) for so long. Well Little J still only has very little hair, Big J at 4 now has some crazy curls. Thank you, Shelley. She had very little hair when she was little, and finally (at almost 29 months of age) it is long enough to do something with. Hope your trip is going better than you feared, and that you are feeling better? Safe travels. Thanks so much, Sharon. Did you figure out what to do on your mommy’s day off? I love her smile. She looks like she is in ballerina heaven. 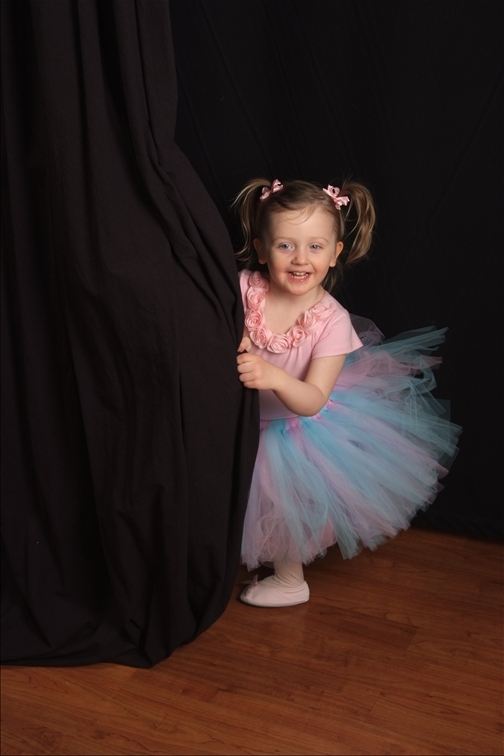 My wife had that little tutu made for her years ago, and she’s worn it in two different photo shoots at two very different ages. I love her smile, too. It warms my heart so. Have fun with your New Years Eve party at Noon. I make my girls a tutu like that every first birthday, cute and so much fun! Peeking from behind the curtain she certainly looks like she’s a star waiting in the wings! She really wasn’t on a stage of course, but it does look like it. Very cool you made your girls tutus on their first birthdays. Loved your blog on the occasion of “Smunchie’s” first birthday. Awww! She’s beautiful and I love the tutu! Her face is just pure joy. First of all, I love your profile picture! Very cute. And that’s a very sweet photograph of a very sweet little ballerina! She’s got a great mischevious look in her eye and I like that! Thanks so much, Kandi. Hope the five of you (counting puppy Charlie) are doing great. Wishing you all the best in the New Year! Megan, always great to see your… um… smiling face. 😉 Thanks! Sweet pic man. Too cute. Daughters they make you love them so hard. You said it, Scott. And I do love her so hard. She is the thing to which my life thus far has been leading. Loving and protecting and taking care of her and my wife is my raison d’être. Always was, just didn’t know it until I met them. I would have killed for that tu-tu as a child. And I considered my little brother dispensable. Probably better they weren’t around. Thank goodness my wife was once a girl. Well, for many reasons, but in this case it’s because I’d be rubbish at knowing the things to get a little girl… like tu-tus. My wife had this one made for her, and she has at least one other I know of. She’s not quite 30 mo’s old, and daddy is completely smitten. Thank you. As for the shoes, my wife found them at a consignment store. 🙂 Actually we get a lot of great stuff (some never used) for good prices there. What a doll! Love her tutu. This really makes me miss my girls being little. Hi! I'm Michael, the founder and editor of adaddyblog.com. I'm a university director by day and a lifestyle blogger by night. More than anything, I'm a husband and a dad. This site targets parenthood from the dad’s perspective, and includes a big focus on family travel, entertainment, technology, social media, coffee, cars & cuddles. ;) Leave a comment on one of my posts and let me know you were here, or connect with me on any of the site icons along the top left of this page! The Perfect Gift Card For Every Occasion! Be the Office Hero – While playing Wintastic Rewards! 5 Tips for Throwing a Birthday Party at Urban Air – Bedford! An App that makes Summer… a little bit Yummier!